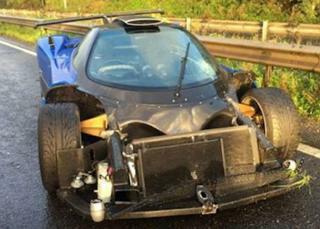 An extremely rare £1.5m supercar was badly damaged after it smashed into a crash barrier in West Sussex. The Pagani Zonda, which has a top speed of more than 200mph (322kmph), crashed on the A27 at Tangmere on Saturday shortly after 07:30 BST. Sussex Police said the driver was not injured but the "one-off" Italian-made car was left with "significant damage". It is thought the car was travelling in a convoy of sports cars at the time and police have appealed for witnesses. "We are hoping someone would remember as it is so distinctive," PC Peter De Silvo said.